Your home is your castle, and every castle deserves a great throne — and throne room. Your bathroom should not only function great but also LOOK great. Here at Campbell’s Construction, we specialize in renovating old bathrooms and making them look and function not new but BETTER than new. Whether you want your water to flow better or your old sink to be replaced with a new one, the New Jersey bathroom remodeling experts at Campbell’s Construction have the experience and know-how to provide you with a bathroom fit for a king! Is your shower’s water pressure not good enough? Or is it too good, and it feels like pebbles are beating at you every time you bathe? Does your toilet run more than Usain Bolt? And let’s talk about your tub: Any leaks? Does the drain hold water? If you’re unsatisfied with the performance of ANY of your bathroom’s plumbing needs, just give the experts at Campbell’s Construction a call! The New Jersey remodeling contractors at Campbell’s Construction can replace the old, worn-out piping in your bathroom with newer, more efficient material in the process of remodeling your bathroom. Thus, you’ll be sure to get the best pressure possible out of your water. And using only the highest-quality fixtures, we will guarantee you the exact water pressure you want! Don’t fret about your bathroom’s performance. The remodeling services experts at Campbell’s Construction will be sure that your bathroom works every bit as well as it will look. Your Bathroom Remodel Will Look Amazing! 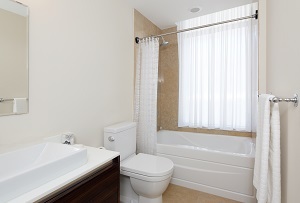 At Campbell’s Construction, we specialize in making your bathroom LOOK as great as it functions. Our expert team has the experience and the skills to install the fixtures you want for your bathroom. Need a new shower? Low-flow toilet? Double sink instead of a single? Not a problem! In addition to all of this, we at Campbell’s Construction can install those fixtures and move your existing ones wherever you want! Whether you’d like your toilet tucked demurely within an alcove or your shower to be just a little further from your sink, you can count on Campbell’s Construction to give you the results you want thoroughly and affordably. For top quality bathroom remodeling in New Jersey, please call Campbell’s Construction at 732-623-9790 or complete our online request form.